My usual night ends up with me spending a few hours on eBay. Shipping, listing, hunting for goodies. 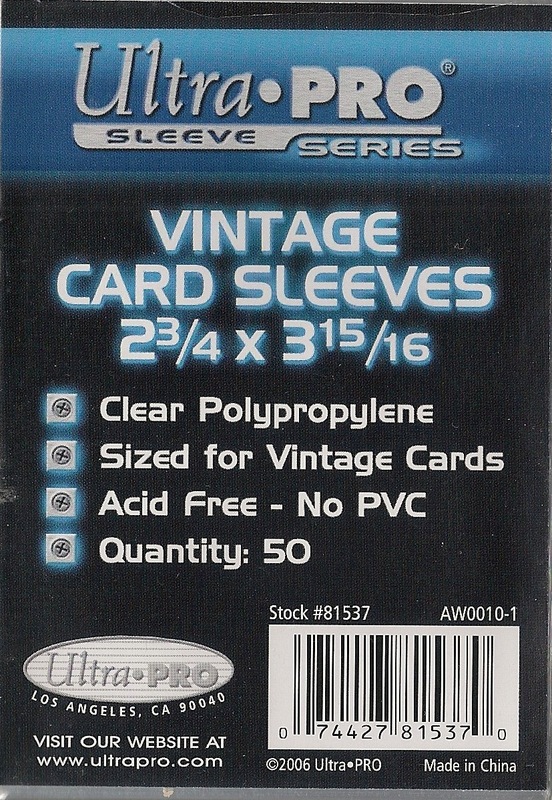 Tonight however, I really thought of how much I love these Vintage Card Sleeves. Yes its corny and yes it is true. These little sleeves are well worth the price paid for them. They cost more than the regular card sleeves but they go a long way. Especially handy for thicker cards. Given the way things are going now, almost all the big hits are super thick cards. I cringe at the thought of shoving them into a top loader with a bastardized card sleeve. These Vintage Card Sleeves are a God Send. If you have not used any, pick some up. They will make your life a heck of a lot easier! Tags: Ultra Pro Vintage Card sleeves are the bomb!